Production on Star Wars: Episode IX kicked off last summer and it appears as though filming is finally getting close to completion. 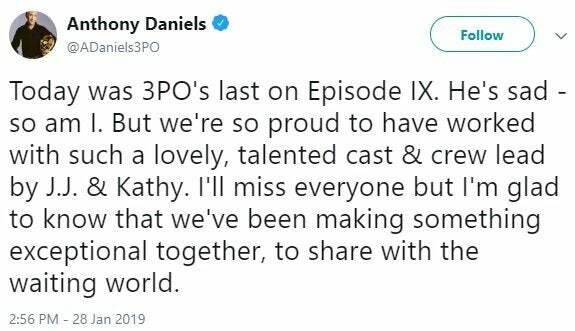 Anthony Daniels, who has played C-3PO since 1977's Star Wars, shared a post on social media confirming that he had finished shooting, saying his goodbyes to the cast and crew with a heart-warming message. The actor shared, "Today was 3PO's last on Episode IX. He's sad - so am I. But we're so proud to have worked with such a lovely, talented cast & crew lead by [director] J.J. [Abrams] & [Lucasfilm president] Kathy [Kennedy]. I'll miss everyone but I'm glad to know that we've been making something exceptional together, to share with the waiting world." Daniels has the distinction of having being the only performer to have appeared in all of the films in the Skywalker Saga, in addition to having brief appearances in Solo: A Star Wars Story and Rogue One: A Star Wars Story. C-3PO's appearance has changed over the years, with his origins in Star Wars: The Phantom Menace displaying only his skeleton structure and necessary inner workings to function, as Anakin Skywalker had to leave Tatooine behind before giving his creation the iconic gold coverings. When the droid reemerged in the sequel trilogy, he had one red arm, which he adopted as a tribute to one of his fallen droid comrades between the events of Star Wars: Return of the Jedi and Star Wars: The Force Awakens. Daniels previously revealed that, not only has his character evolved on screen, but his on-set costume has also improved over the years. He added, "Back in the day, I was basically locked in that suit… to begin with, of course people would just come up to me all the time and say, ‘Gosh, you look fantastic. This is incredible. You are a perfect droid.’ Because nobody had seen a costume like this. But after a few days, I had become an object. People forgot I was in there." Fans can see Daniels' performance as C-3PO when Star Wars: Episode IX lands in theaters in December. What do you think will happen to C-3PO in the final film in the Skywalker Saga? Let us know in the comments below or hit up @TheWolfman on Twitter to talk all things Star Wars and horror!